Bishop Denis Nulty led “a faith-filled farewell” to Fr John Cummins at a requiem Mass in Abbeyleix on Saturday. 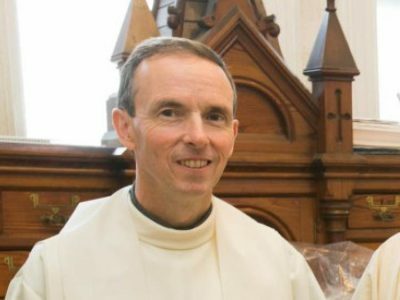 Fr Cummins died tragically last Wednesday following an accident involving his car. On Saturday, in the Church of the Holy Rosary, Dr Nulty explained that they were all on a journey with Fr John, a journey that began with Mass in Carlow Cathedral on Thursday night and continued on Saturday with his funeral Mass in Abbeyleix. It concluded on Monday with Mass in St Conleth’s Parish Church, Newbridge, “the home where his vocation was nourished”, before his burial in the family plot with his late dad, Con, who died in February 2003, in St Conleth’s Cemetery. Fr John Cummins served as parish priest in Abbeyleix for 18 months. He also served for four years in Naas. He spent five years pursuing further studies in Rome and another five as chaplain at the Institute of Technology in Carlow. He spent 12 years in the Cathedral Parish in Carlow, acting as Cathedral Administrator for 11 of those 12 years. The Bishop said he could not do justice to the amount of texts and emails that had poured in since Wednesday evening in response to news of the popular priest’s death as well as many messages that were relayed through social media. The irony, he noted, was that Fr John Cummins was “very much a slow convert to even the simplest mobile”. After arriving in Abbeyleix in August 2017, “the luddite was converted” and he began not only to use a mobile, but “turned up to meetings, mostly late mind you, with an iPad under his arm, which he furiously typed on, as the meeting progressed”. The late St John Paul II saw a priest as a man for others. “I couldn’t but note the responsorial psalm refrain last Wednesday: ‘You are a priest forever, a priest like Melchizedek of old’. Fr John Cummins was that priest, a priest to his finger-tips,” Bishop Nulty said.